They have these things in France called Hotel Dieu, which literally translates to Hotel of God. It's not a hotel though, it's a hospital. But I could imagine some confused travellers trying to stumble in one with all their luggage looking for a bed. I wonder what a hostel run by God would be like. Based on my experience as I've travelled, I wonder how God would react if I stumbled up to the Hotel of God at 3am, drunk as usual. Banging on the doors for 5 minutes, finally God, rubbing his eyes after being awoken from a deep sleep, unlocks the door. "Sorry about that," I slur, "I didn't mean to wake you." "Do you have any idea what time it is?" God asks, his voice shaking with anger. "Well, it's 3 am. The doors are locked at midnight," God says, pointing at the small sign beside the door in Spanish. "I'm sorry, I lost track of time," I try and apologize. "Don't try and pull the wool over my eyes," God says, "I'm omnipotent. I see and know all, and I know you're lying. You were well aware of the time, you were just selfish." I hang my head in shame. "I'm sorry my Lord," I say, though really I'm thinking, "enough with the lectures, dude. I'm paying 10 pesos to stay here, and I should be able to show up any time I want." "Don't think I didn't hear that," God says. "10 pesos does not entitle you to break the rules. It was made very clear when you arrived that the doors were locked at midnight." "Actually, I'm not really sure I understood that," I plead. "Mmmm," God says, pausing. "Well, I suppose you are right. I guess I should have switched over to English to speak to you given that your small brain can't handle multiple languages. Okay, I'll take the blame on that one. But you know for tomorrow, show up by midnight." "I will," I say, nodding my head eagerly. "I'm not sure I believe you," God says. "You know, I could force you to show up at midnight. I am, after all, omnipotent. However, I am going to give you free will to decide to show up by midnight or not. But, let me warn you, if thou does not show by midnight, I won't answer this door and you will sleep outside all night. Or maybe I'll turn you into a pillar of salt. You never know with me. I move in mysterious ways." For breakfast on Thursday I had a cheese that smelt vaguely like horse manure. What this town needs is a Denny's. From the anonymous dead of the catacombs last week to the famous dead of Pere Lachaise cemetery this week. If the catacombs are the tenements of Paris' dead - nameless masses packed on top of each other, forgotten by history except in en masse - then Pere Lachaise is the grand avenues and mansions of the rich. Everyone has a monument, and all of them above ground and elaborate. 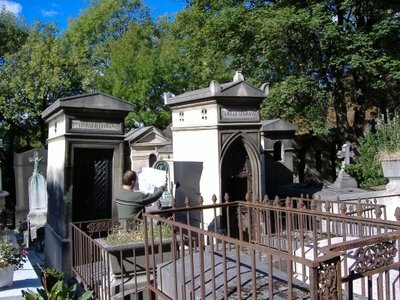 Many of Pairs and the world's great names are buried in Pere Lachaise. With a handy 2 euro map, I managed to find the graves of Balzac, Chopin, Callas; Piaf, Modigiani and Moliere, among many others. 3 notable graves stood out. Oscar Wilde's tomb is massive, one of the largest in the entire cemetery. A large marble structure with some sort of flying Egyptian man. To honour Wilde, mourners paint their lips the brightest red, and place a kiss upon his tomb. The white marble is spotted with red. Jim Morrison's is the most visited grave in the cemetery, with many people coming just to see it. It's a simply marker, but has become so overrun with tourists, they had to cordon it off so you can't get close to it. I have heard they are thinking of moving Morrison out of the cemetery to prevent further damage to Morrison's marker, or those around his. It was strange seeing Morrison's grave. I was reminded of being in Versailles, as all I could do was try and peek at it through a crowd of heads. The biggest thrill for me, though it was unintented, was to come across the grave of Fulgence Bienvenüe. Beinvenue was the lead engineer on building the Paris Metro, which I professed my love for back in my April entry. I thought of leaving my Carte Orange (the weekly Metro pass I have) in tribute and walking back to my hotel to see what a Paris without the Metro would be like, but decided against it at the last minute. It's a large city.